Moments after Darla Jantsch gave birth to her first child on July 1, 1982, she knew something was wrong. 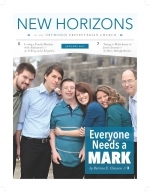 As a nurse, Darla recognized that their newborn son had Down syndrome. Her husband, Steve, however, suspected nothing. When their doctor told them in the recovery room, Steve fell apart. The story of Jesse’s journey is one that is at the same time sad and joyful, ugly and beautiful. It raises a question we so often ask throughout our lives: “Why does God allow this to happen?” It seems to be a frequent question when you are a parent of a child with special needs.